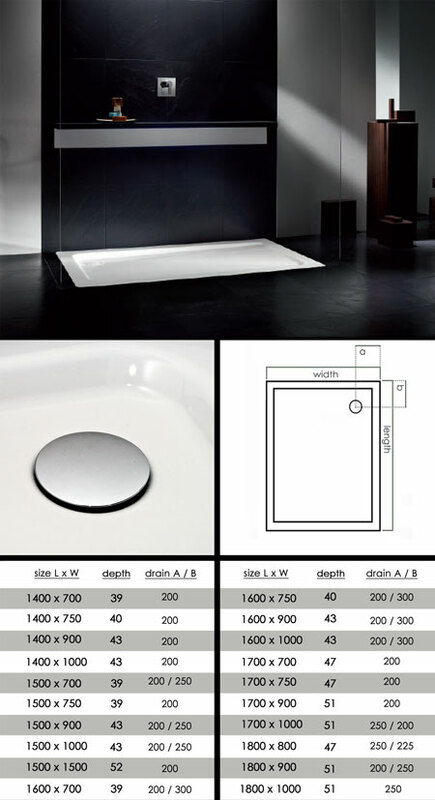 This top quality low level shower tray with height thickness of between 39mm and 52mm depending on tray size required. Each thin Showertray is made out of 2.5mm steel with extremely hard wearing stove enamelled finish. The enamel is baked on at a temperature of 850 oC and is so hard wearing that it is acid resistant, impact resistant and scratchproof.These flush shower trays are so stable and long lasting that are supplied with a 30 year manufacturers guarantee. * Made of thick steel. * Thinnest UK shower tray. * Shower tray supplied in 19 sizes.